Robert Rauschenberg, performance still from Open Score, at FCA-supported “9 Evenings,” 69th Regiment Armory, New York, October 23, 1966. Performers: Frank Stella and Mimi Kanarek. Photo by Peter Moore © Estate of Peter Moore/VAGA, NYC. Morton Feldman with John Cage, c.1960s. Photographer unknown. Courtesy SUNY Buffalo Music Library. Tickets for talk by Norman O. Brown, “Six Lectures," 1966. Courtesy 92nd Street Y Archives. 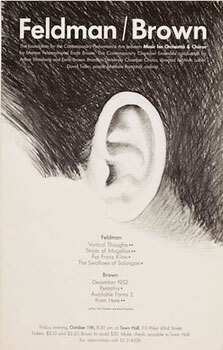 On October 11, 1963, the Foundation for Contemporary Performance Arts held its first publicly sponsored event.The performance, “Music of Orchestra and Chorus by Morton Feldman and Earle Brown," was conceived of by Foundation co-founder John Cage as an opportunity for Feldman and Brown to present four works for a large ensemble.Each composer received commissions for a new work from the Foundation: Brown's “From Here," and Feldman's “Vertical Thoughts." In late summer 1963, John Cage curated a series of benefit concerts at the Pocket Theatre in the East Village. He coproduced the concerts with Lewis Lloyd, who had opened the off-Broadway theater with Arthur Conescu in 1962. 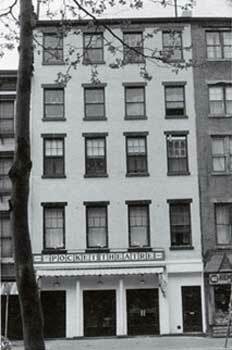 “Pocket Follies," organized by James Waring, was the first benefit concert held at the Pocket Theatre, and was held on June 10, 1963. Cage followed this event with a benefit series, “New Music at the Pocket Theatre," on three Monday evenings in August and September of the same year. 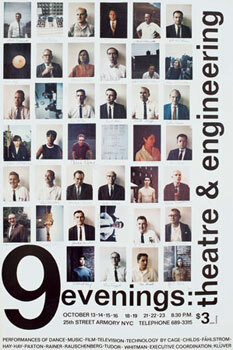 In 1966, Foundation for Contemporary Performance Arts, in collaboration with Experiments in Art and Technology (E.A.T) hosted the performance series “9 Evenings: Theatre & Engineering." The series was comprised of a set of collaborative performance works between contemporary artists and scientists. Ten New York artists, composers, and choreographers worked for nine months with engineers from Bell Telephone Laboratories to make works that incorporated the new technology. These performances were presented over nine nights at the 69 th Regiment Armory in New York. 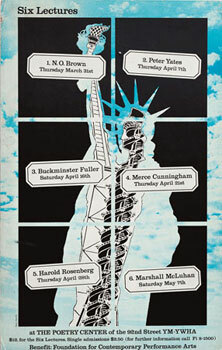 In 1966, Foundation for Contemporary Performance Arts held “Six Lectures," benefit series featuring presentations given by Norman O. Brown, Merce Cunningham, R. Buckminster Fuller, Marshall McLuhan, Harold Rosenberg, and Peter Yates at the 92nd Street YMCA. For six consecutive weeks, the lectures were given to sold-out crowds. Each differed in topic, but were connected through “an interest in positive attitudes in a period of cultural change." Norman O. Brown (1913-2002) read three chapters from his book Love's Body (1967). Merce Cunningham's (1919-2009) lecture “Talk By a Dancer" was a hybrid of lecture and dance performance. R. Buckminster Fuller (1895-1993) spoke for more than three hours, during which he challenged the audience with a big picture of global trends and the accelerating evolution of humanity's relationship to “spaceship earth." Media theorist Marshall McLuhan (1911-1980) touched on a number of key themes, which would be further explored the following year in his The Medium Is the Massage: An Inventory of Effects. Harold Rosenberg (1906-1978), who was largely connected to Abstract Expressionism, explored the ramifications of media on art-making and the museum. Composer Peter Yates (1909-1976) contributed a talk featuring several musical samples of three-to-four minutes duration. In 2015, in keeping with FCA's mission to support artists, the artists on the Board decided to invite an artist to organize a small-scale exhibition in a 496-square-foot space located adjacent to the Foundation's office. "Six Doors," curated by Rachel Foullon, included work by Trisha Donnelly, Andrea Longacre-White, Alex Robbins, Melanie Schiff, Marianne Vitale, and Mary Weatherford. The exhibition opened on May 19 and closed on August 7, 2015. 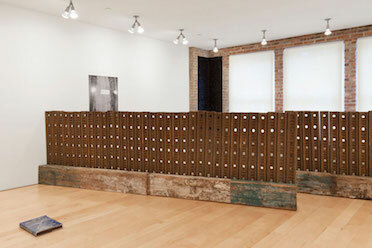 It was reviewed on ArtinAmerica.com and TheArtNewspaper.com, among other sites.